As you may have guessed from my Instagram activity last weekend, I was in Cabo to celebrate the wedding of my dear friends (and former rewardStyle bosses) Amber and Baxter! It couldn’t have been a more beautiful setting and let’s just say the drinks were flowing freely all weekend. I picked up this dress during NET-A-PORTER‘s end of season sale in the fall and finally got to wear it this weekend! Isn’t it the perfect beach vacation ensemble? Love the tropical, bright colors and breezy silhouette. I paired it with my favorite Aquazzura strappy sandals and an Alexander Wang iPad case (turned clutch) for the evening. I do have to note my accessories which are all rather budget friendly – my sunglasses are from Forever 21, and my necklace is Gorjana. I love Gorjana’s pieces because they are so delicate and simple. They make wonderful gifts too! This dress is another one by ISSA that my mom just picked up a few weeks ago, and I’m dying to borrow it! This vivid orange number would also be absolutely perfect for a summer wedding – how gorgeous is that embellished collar?! That dress is so pretty on you, Issa has the best prints. Gorgeous! Such a perfect outfit for the occasion! Love the bright colors! Hope you had a good time in Cabo. Have a nice day, Merritt! Such a pretty outfit! Love anything with tropical prints! That print makes such a statement yet it isn’t overwhelming. This would be gorgeous for summer! That dress is so pretty and perfect for a beach wedding! And I love the simple, chic accessories. The location looked beautiful on your Instagram! I love your clutch and the colors on that dress are gorgeous! I was waiting for these outfit details! That print is so pretty and perfect for the tropical setting. I’m absolutely loving this dress, such a gorgeous, fun, tropical look! And those sunglasses are F21?! NICE! Love how you used an iPad case as a clutch!! That dress is fantastic – I love finally getting to wear something you have waited along time for! Worth the wait because it looks perfect and the photo backdrop perfectly matches too! Gorgeous girl! 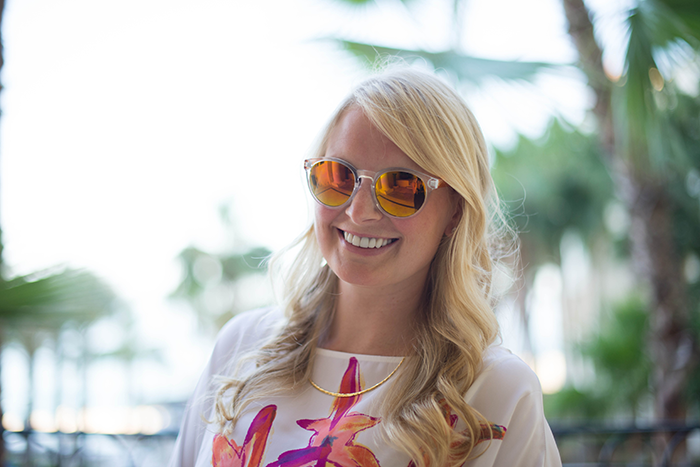 Love the bright colors… Could not be a more perfect outfit for Cabo. The silhouette of this dress is perfection on you. I love anything with botanical print, so I would definitely wear this dress! How gorgeous are you?! Such a perfect dress for a beach vacay and the wedding looked like so much fun. Love that the orange-tinted sunglasses bring out the orange in the pattern. Enjoyed seeing your Cabo pictures, so jealous! And the print on the dress is beautiful! That is SOO gorgeous on you! Makes me want to go somewhere tropical! That dress is completely amazing, I want it for summer!! The most perfect cabo look!!!! Love it!!! Have a great weekend!! This is such a fun look! Love the gorgeous print and colors! Such a beautiful vibrant print! 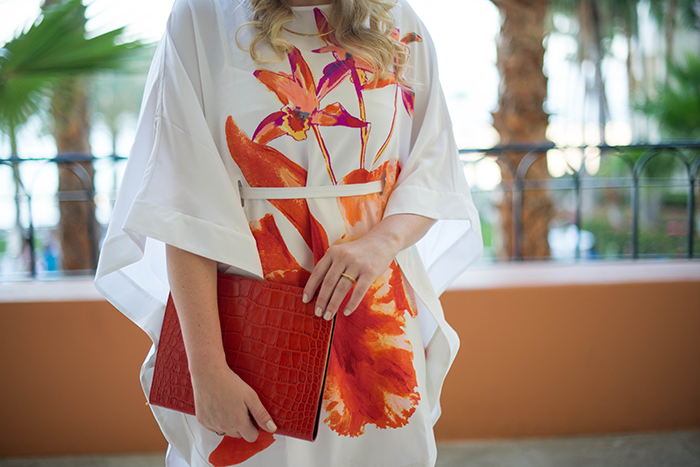 Great style for a wedding and for Cabo!